One of the best things about celebrating children's author and illustrator birthdays is rereading my family's favorite books each year. The birthday serves as a reminder that we have some really great books on our bookshelf that need to be read again. I have found that revisiting a picture book after a year can provide a completely new experience especially for a family, like mine, with young children. This is one of the bookshelves in our home. This one holds books by the authors and illustrators whose birthdays we have celebrated on the blog. All the books are in alphabetical order by author/illustrator's name too! This makes it easy when we want to read a book by.....KATIE DAVIS! Last year, we celebrated Katie Davis' birthday by reading her book Who Hops? and then developed a game for my 18 month old son (Click here to read the blog post). 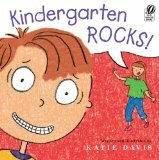 This year, we reread many of Katie's picture books including Kindergarten Rocks and I Hate to Go to Bed!. But, once again it was Who Hops? and the sequel Who Hoots? that inspired a birthday celebration for Katie Davis. In last year's birthday post, I mentioned Katie Davis' podcast Brain Burps About Books, which now has aired over 120 episodes. I included a quote that Katie said during an interview with The Happy Accident about the podcast, "I love doing it. I love talking books, or the book business with colleagues. I love that there are a bazillion subjects I could cover and still have more to talk about. I love promoting other people and helping my listeners with their careers." When you listen to the Brain Burps podcast you will immediately be drawn to Katie's positive and encouraging personality as she talks with her guests about various topics in the children's book industry. I personally have learned quite a bit from listening to the podcast. Sometimes as I am listening, I just want to give her a "High Five" for something she has just shared! I will never forget the time she had a whole show on eBooks which inspired me to write my own eBooks. This year, I came up with an activity that allowed me to give that "High Five" to Katie Davis that she so deserves for everything she has done for so many people. My wife and I were talking about Katie Davis's books Who Hops? and Who Hoots? and how they are perfect for teaching categorization. 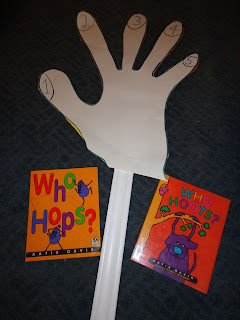 In Who Hops?, the book begins with a simple question, "Who hops? ", and then three animals are shown that are able to hop -- a frog, a rabbit, and a kangaroo. Next, a cow is shown to the reader -- which of course can't hop. Our favorite part is on the next page when we shout "NO, THEY DON'T!" The book follows this pattern for other actions like flies, slithers, swims, and crawls. My wife told me about a game that she heard second grade teachers were playing with their students to explore categorization called "GIMME 12". GIMME 12 challenges students to come up with 12 things in a given category. I thought 12 was a bit much for my children, and thought GIMME 5 would be much more appropriate. Not only was it appropriate, but it inspired an evening of fun for my family! I made a giant hand out of poster board, cardboard, duct tape, and a piece of wood. 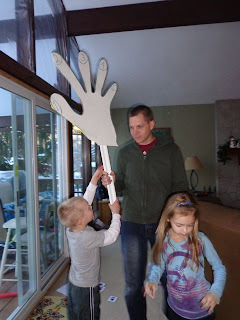 The poster board was too flimsy so I added cardboard to make my giant hand nice and sturdy. I asked my kids to GIMME 5 things in a given category. I started with easy categories like, "Gimme 5 of your five favorite Christmas gifts" or "Gimme 5 of your favorite things to eat". My youngest son is coming to terms with his tree nut allergy and he said, "Gimme 5 things no nuts!" I liked this photo. It looks like I was going to swat my daughter with the giant hand. Actually, I was just really excited about how much fun we were having. 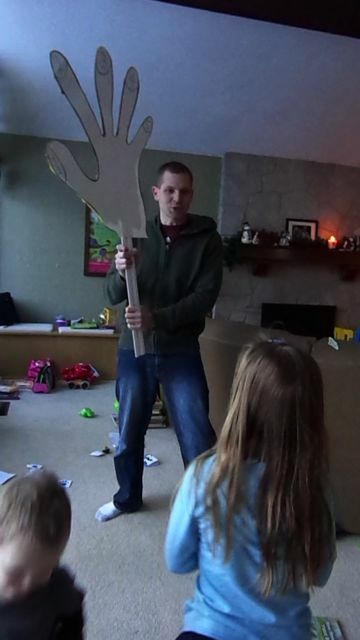 In the video below, you get a sense of my enthusiasm as I challenged my son with a question that is similar to a scenario presented by Katie Davis in Who Hoots? I had another idea to explore categorization using the GIMME 5 idea and Katie Davis' books. 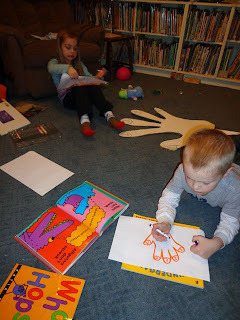 We traced our hands and then wrote a question on the palm. My kids then wrote or drew 5 things on the fingers that fit the category. In this example, my son came up with the question "Who has legs?" He drew a few people, a dog, and a cow. 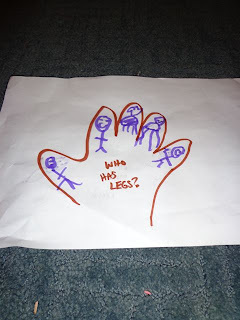 Once this was complete we turned the paper over traced his hand again and tried, "Who doesn't have legs?" He came up with a fish, a shark, a jellyfish, a whale, and a snake. If you have a few more moments, please click here to read last year's blog post. Katie shares a few birthday memories! She has mentioned to me in the past that January 4th is hard time to have a birthday, as far as celebrating goes, because everyone is partied-out from the New Year. However, one benefit of having an early-in-the-year birthday is that her name will sit at the top of my Children's Author and Illustrator Birthday List on the side of the blog! Katie, thank you for everything you do for the Kid Lit community! Here's a virtual "High Five" coming your way! Have a great birthday! 1. The Official Katie Davis Website -- TONS OF FREE PRINTABLES! In this video below, Katie gives a tour of her studio! Eric, that's such a great idea! I watched the video and then recommended my housemate play it with her five year old nephew! I love the enthusiasm in the video too...good job! Happy Birthday to Katie! Loved seeing a tour of the studio! 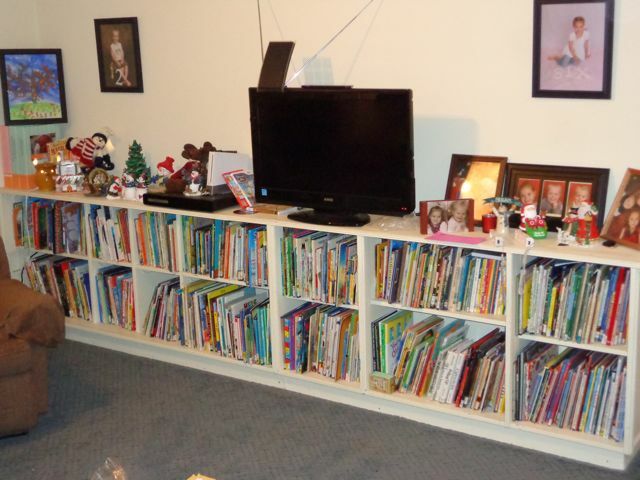 I LOVE your bookshelves, Eric! 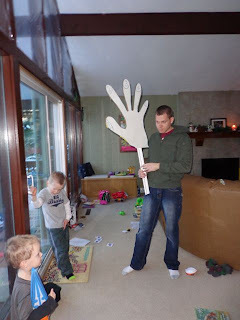 Great post and high five hand! Delighted to wish Katie a happy birthday (even if I'm a day or two late!) Fun post, and like Joanna, I love your bookshelves!